POLYEDITOR from CAD Design Software is, as the name suggests, your one stop app for polyline editing. Everything from displaying length and length reports to changing width, normalizing width and fixing changes, this app does it all. Check it out for free today! This application will start in Trial-Mode and allow 10 trial runs or 1 day, whichever comes first. 1. Display Polyline Lengths - Places the numerical length of selected polyline segment(s) in text alongside the Polyline using user-defined text Height, Angle and offset. 2. Break Vertices at Intersections - Breaks selected polylines wherever they intersect on the same layer or different layers. 3. Fix Mixed Polyline Widths - Changes polylines with multiple widths and abrupt width changes into polylines with single widths or into multiple polylines. 4. Change Polyline Widths - Changes polyline widths globally, by layer or by creating a selection set. 5. 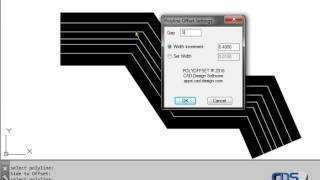 Create Text Reports of Polyline Lengths - Reports the lengths of polylines on a selected layer. 6. Check Polyline Width - Checks polyline widths in a drawing and compares them to a user defined polyline width if meet minimum or maximum widths.